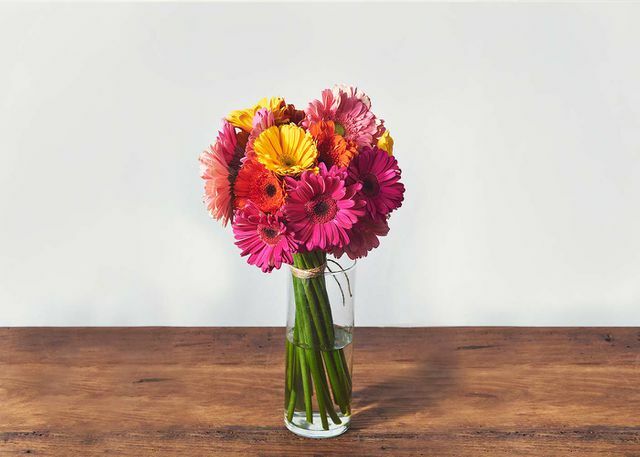 Inspired by Lewis Miller's West Village Flower Flash where Lewis dotted a recycled Salvation Army clothing depot with 550 perky blooms, these sherbet colored Gerber daisies exude limitless joy! Unlike the Flower Flash, this hearty arrangement will last for days. Cluster them together or place individual stems in a series of bud vases and spread the happiness in every room of your home. A Flower Flash is an urban street art installation created by Lewis Miller and his team of merry, floral bandits. The New Yorker coined Lewis, The Banksy of Floral Design as these Flower Flashes are created under the cover of darkness, usually before dawn and always with living flowers. Using trash cans, construction sites and iconic statues all over New York City, Lewis makes these random acts of flowers and kindness simply to bring joy to everyday New Yorkers. The installations are fleeting but the feeling of goodwill lasts. By purchasing this Flower Flash inspired arrangement, you too are creating an act of goodwill. Portions of the proceeds go to ProjectArt, an organization that empowers youth through free after-school arts education.